If you've been aching to try some delectable vegan desserts, give the following tofu peanut butter cookie recipe a shot! This dairy-free, egg-free, animal-cruelty-free creation will taste amazing for vegans, vegetarians, and non-vegetarian alike. Make sure you have the following supplies and ingredients gathered together before the cookie baking fun begins. While the oven is getting hot, go ahead and combine the whole wheat flour, salt, baking soda, chopped peanuts, and oats in one of your large bowls. In the other large bowl, cream the brown sugar, maple syrup, vanilla extract, and peanut butter together to create a thick peanut buttery paste using your whisk. In the following order (from most fluid to most solid) pour the rice or almond milk, oil, applesauce, and silken tofu into the blender. Blend on medium-high, pulsing as much as necessary to ensure the sauce is thoroughly blended into a smooth mixture. 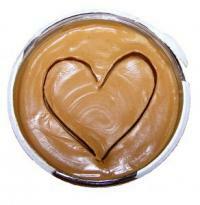 Add the blended sauce to the peanut butter paste, once again whisking until everything is smooth. Now gradually add the dry oat-flour mixture to the peanut butter paste and mix it in well. This completes the cookie dough. Place heaping spoonfuls of cookie dough onto your cookie baking sheet leaving two inches of space between them. Bake for anywhere between 15 to 20 minutes, depending on the size of cookies you are making. Keep an eye on them after 15 minutes, removing them from the oven when they are set and begin to take on a golden brown color. Let the cookies cool for three minutes on the baking sheet. Proceed to move them onto a cooling rack. Optional: Sprinkle on a bit of powdered sugar, cinnamon, or both. 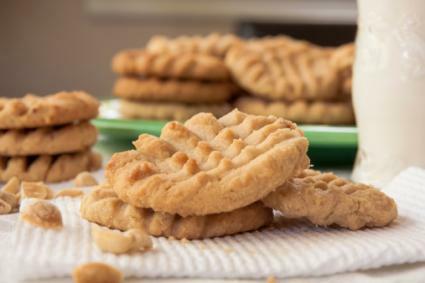 If everything goes accordingly, this yummy tofu peanut butter cookie recipe will produce moist, chunky, and chewy delights. The recipe will make about four dozen large cookies (or five dozen smaller cookies). If you're not a fan of chunky peanut butter cookies, simply eliminate the chopped peanuts from the recipe altogether. Also, dark chocolate chips or carob chips can be added into the recipe to add a sweet twist!